There are only a couple of activity options available for the person with a standing desk. The walking treadmill desk, a mini stepper, and a seated standing desk cycle. By comparison, the treadmill desk is great but big and expensive. The mini stepper is wonderful, small, portable, and affordable. The only issue with either of those two options is the fact you are still standing. The drawback to a standing desk is you aren’t getting a whole lot of movement in the workday. Added to that, the blood is still pooling in your legs because your legs aren’t moving. “Sitting Disease” isn’t the only health issue when spending 8 hrs virtually motionless in an office. Not everyone who stands does so at a fancy standing desk. Many folks work in factories “on the line” or at the checkout in a brick and mortar store. Standing is hard on the back, knees, hips, generally it is just not good to stand in one spot for too long. Our bodys were made for movement! Stand-sit desks can cost thousands of dollars. There are table top designs for less or you can makeshift your own version of a standing desk. Regardless of which one you have the seated standing desk cycle is a wonderful addition to your workspace. The seated pedaller will fold easily out of the way plus it comes with exercise bands so you can exercise your arms, back, shoulders, and core. As you can see in the picture you don’t need to be sitting and pedalling or standing. You can stand a bit, then sit a bit without having to change your work environment. 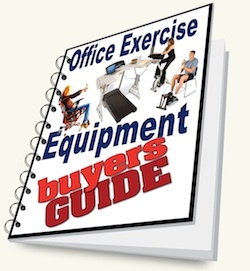 This is especially useful if you can’t move your desk or working at a counter or on a conveyor assembly line. Because you can set the pedaller seat to different heights, you can set it up right next to or directly behind your workspace. When you get tired of standing just take a short step behind or to the side and now you can sit and pedal, still at the same height as when you were standing. You can continue to work while pedalling without interruption at the same counter you usually have to stand at all day. Stuck at work all day can make it difficult to get and stay fit. Here are some ideas on how you can burn off some calories and tone up muscles while standing at work all day. – Stand at the counter or table with legs comfortably apart. About shoulder width. – place your hands lightly on the countertop. This is just so you can catch your balance if you need to. – Shoulders squared and gently pulled back. – Pull in your belly button toward your back. Then hold your abdominals firm. – Next pull yourself up on your toes. Hold for a few seconds while you squeeze your calf muscles. – Repeat for a few times. If you have room under your counter to raise your knee face the table. If not then turn to the side. – Place hand on the countertop to provide balance assistance if needed. – Bend one knee and raise it so the thigh is parallel to the floor and the lower leg is perpendicular. If you are standing to the side of the counter, raise the leg on the opposite side. – Keep the pelvis straight, don’t let the hip of the leg in the air move up. – Be sure your shoulders are straight and slightly back. – Pull the belly button back toward the spine and hold your abdominal muscles firm. – Hold the leg in that position for a few seconds. – Do the other leg. If you had to stand to the side of the counter to do the exercise then turn the other side. Make sure you have a clear path behind you to do this. – Standing facing your desk, place hands gently on top for balance. – Without bending forward, reach one leg back behind you and toe pointed so the toe is touching the floor. – Gently tighten your glutes and hamstring, keeping the leg straight as you slowly raise your toe off the floor. Only raise it a few inches until you feel a squeeze in your buttocks. – Release the tension allowing your toe to return to the floor and immediately repeat without resting your toe on the floor. – do this a few times then switch legs. 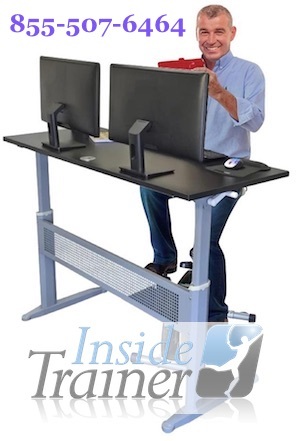 The Standing desk cycle is great for intermittent sitting, and sitting and pedalling. you can use it to really burn off some calories or just for keeping the blood moving in your legs. A low-intensity activity is perfect for the person who stands all day but wants to get the blood pumping. This will burn calories, and help improve concentration and productivity. You get to choose whether you sit and pedal when your legs get tired or set a timer and pedal at scheduled intervals. Adding movement helps with digestion and improves metabolism. ⚠ *NOTICE* – this will burn calories and you might work up a sweat. If sweating is an issue then just wear sports under clothes that you can swap out easily. This clothing is specifically designed to wick away sweat so your body and outwear will remain dry and stink-free. After standing for 20 minutes your legs will need to warm up first. For the first step in this process you will need to use a journal. This is to keep track of your times and efforts. Everyone has different levels of fitness so it is best to start where YOU are rather than try and copy from someone. ➤ start pedalling slow. Set the resistance dial for level 2 or 3 – pick the one that you can pedal comfortably but still feel a little resistance. Pedal this way for about 3 minutes without looking at the LED Digital Display. 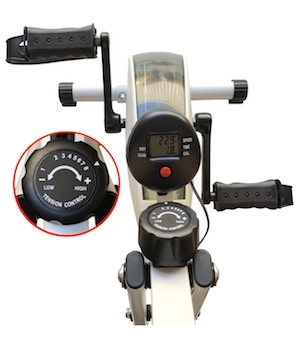 After you have pedaled comfortably for 3 minutes, look at the display and write down the numbers. For example if you are pedalling at 22kph on level 2. Make a note of that. This will be your starting point. ➤ After the 3 minute warmup now add another notch on the dial to (example) level 4. Pedal at the SAME SPEED for 2 minutes. How does that feel? Harder? ➤ After the two minutes drop the dial back to (example) 3 and continue to pedal at that speed for 3 minutes. ➤ Keep the dial at level 3 but now speed up. Without looking for one minute pedal as fast as you can. Now look down and see the speed. For this example let’s say you were able to pedal 28kph. Write that down. HIIT is High Intensity Interval Training. Intensity can be increased by: Speed, Resistance, or both. Step one here you increased the resistance. Step two the speed increased. 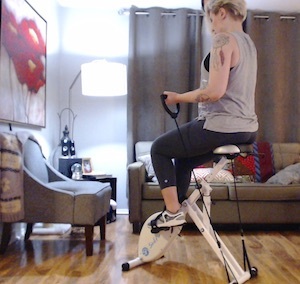 When designing HIIT on your Standing Desk Cycle you can mix and match or do one at a time. Here are three examples, one of each. A “cooldown” is where you pedal for 3 minutes in a slow and comfortable pace. You should be able to work at your job during this phase. The suggested cooldown period is 3 – 10 minutes depending on age and how hard you had been working. You can continue to pedal at this pace for as long as you feel comfortable to do so. This HIIT program uses speed for added intensity. The resistance level will remain the same for the entire workout. This HIIT program uses resistance for added intensity. The speed will remain the same for the entire workout. This HIIT program uses both resistance and speed for added intensity. When you are finished with your standing desk cycle for the day – just fold it up and roll it off to the corner! 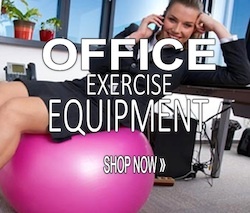 Here more information on other standing desk exercise equipment.